Online registration for Gotta Dance Preschool classes (Baby Ballet, Rainbows, Unicorns, & Stars) begins on Tuesday, May 1st at 8:00pm. Registration for all other classes for returning Gotta Dance students begins on Monday, June 18th, 2018 at 6:30 am. Registration for new families begins on Thursday, June 21st, 2018 at 8:00am. Class schedules will be posted on May 1st Gotta-Dance.com under ‘Schedules‘ for the upcoming 2018-2019 season. Please view the video below and read the directions as they are very important to the success of your enrollment. Adding a class to your cart will NOT enroll your student in the class! You must click your cart and click the green ENROLL NOW button at the end to submit your enrollment. Please pay close attention to this!! Click Add to Cart – You are NOT enrolled yet, it only places class(es) in your cart!! When you are done adding classes to cart, click your cart in the upper right part of your screen and then click the GREEN Enroll Now button.The green Enroll button MUST be clicked for all your classes to be submitted for enrollment. View Notes to see all the classes your dancer has taken click “Notes” under each 2017-2018 class to find your recommendation for next season. *Be sure to check your portal for updated information the Friday before registration. You may register for any dance class up to the level that your teacher has recommended. (For Example, a dancer who is recommended for an AQUA jazz class may register for Aqua jazz, or any jazz level lower than Aqua.) Dancers who register for a level higher than their class recommendation allows, will be removed from the class and emailed an error notice at time of registration. INTERESTED IN STARTING A NEW DANCE STYLE OR ADVANCING YOUR TECHNIQUE? Email the office at office@gotta-dance.com to learn about summer private lesson availability. Private Lesson rates can be found on the Private Lesson webpage under Current Students. Dancers who complete summer private lessons will be evaluated by that educator at the end of the sessions for fall level placement. 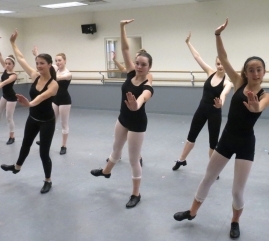 Please note: Beginning dancers in Middle and High school may register for Garnet MS/HS Ballet and/or Tap held in our Basking Ridge location this fall! Please verify that your family’s portal log-in ID and password work properly by Friday, June 15th at noon to avoid any delays in registration. The Gotta Dance office will not be available to help troubleshoot any log-in issues during the first two days of registration (June 18th and 19th). *All Ballet & Pointe classes must be registered back-to-back. Please note that if you register for more than the allotted number of classes in the initial period, we will use our discretion to determine the appropriate number of classes and drop extra ones. You may begin registering for additional (multiple classes) on Thursday, June 21st. When registering online we require payment for the June 2019 tuition and a $30 registration fee by credit card. Both the June 2019 tuition and registration fee are non-refundable. After initial registration, you may request to pay by cash or check for September’s tuition. You may only pay by cash or check by registering in person at the Branchburg Studio office during registration week, June 18th-June 22nd. Before submiting a dance class registration, please double check that you are registering for the correct/intended class. Beginning one week after initial registration, Gotta Dance will charge $5.00 for a switch/transfer from one class to another. This fee will be charged to the credit card on file the month that the switch/transfer occurs. The Gotta Dance Office at our Branchburg location will be open on June 18th from 6:30 am – 5 pm and June 19th from 7:00am-5:00pm. Gotta Dance’s registration staff strives to make the registration process as efficient as possible. For this reason, they will not take phone calls and/or return e-mails during these days. Beginning on June 20th the office will be open from 9:00 am to 5:00 pm and will begin taking phone calls and returning e-mails. Thank you in advance for your patience and understanding.